Well, back to reality - I mean - I am so fortunate to in the same week play water volleyball in Cancun, Mexico and then turn around and garden in Richmond, Virginia (all during the second weekend of March). 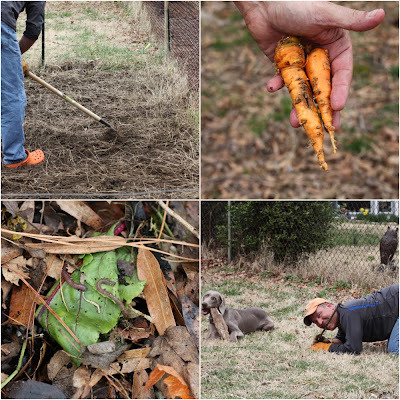 While Saturday was spent turning the garden for the first time in 2011, finding carrots from last year's crop, adding worms to the compost bin, and even time to chew on a couple of sticks. I hope all of your gardens yield a successful bounty this year and stay tuned here at E.A.T. to see how things grow in our garden. What will you be growing this season? This will be my first year fully devoted to gardening. I'll have a lot of help from the future parent in laws though. Not sure what all we will be growing yet. Just put our seeds in the indoor planter. So far we have Arugula, Spinach, Swiss Chard, Broccoli, and Carrots, Beets, and Peas to start.